Please refer attached file 1_img. Here, there is a shaded area in chart for value 0-20% as per slider value. We want to display that shaded area as per slider value selected by user. If user select 10% then shaded area is display for 0-10%. Please refer attached file 2_img. 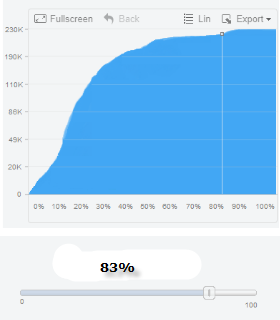 There is a vertical line display in chart for value 83% as per slider value. We want to display that vertical line as per slider value selected by user. 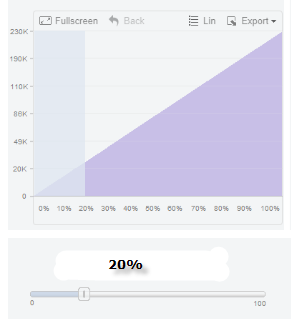 If user select 20% then that vertical line is display at 20%. Same as point-2 require vertical line in chart as per slider value selected by user. 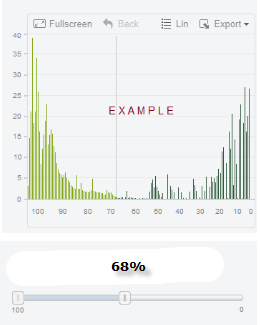 If vertical line is displayed at 70% then stacks before 70% should be displayed in different color and stacks after 70% should be displayed in different color. 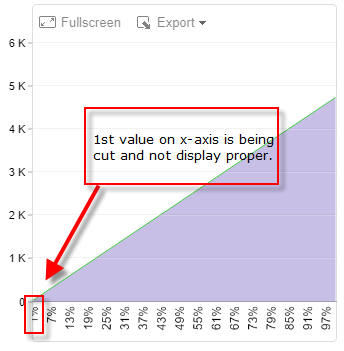 Value is not proper display on X-axis. If we have value from 1-100 on X-axis then is it possible to display value on X-axis like 0,10,20,30,40,50,60,70,80,90,100 ? Find any solution for given points ? Please reply, if found solution for any points. We typically provide an answer within 1 business day, you shall receive it today. Please provide the images that we should refer to. The x-axis is where categories are displayed and values are displayed on y-axes (valueAxis). I have uploaded images but is there any issue why images are not displayed ? I have again upload images. Please refer it. Solution that you given for issue number 4 is not proper for us because we have an issue for display value on X-Axis as per 4_img. Please refer images that i have upload again. This is not currently possible exactly as you would like. As on the facetAxis you have categories (10%, 20%, 30% etc..), then you can select the category column as smallest entity. Even if the column is painted as area. So line wouldn't be possible, but instead area would work ok. Note that exactly 83% wouldn't be possible to be displayed because of the same reason. There is an option where you create a new series as type: column and display only the column that corresponds to the selected percentage. In this case also the column isn't the same as single line. And I doubt that this would be better choice as in previous example. Another option is to add this as feature request. Again only areas can be selected. Meaning what would you like to do with the selected column as at least one column would be selected. I'm not sure I get it exactly. If you want to display categories on the facet axis like 0,10,20,30..., then please take a look at any of previous examples. Solution for Issue 1 ,2 and 3 are perfect. According to fiddle, on X-Axis categories is not displayed properly. We have categories from 2000 to 2020 on X-Axis. So we just want to display all data in chart and only few categories on X-Axis like 2000, 2005, 2010, 2015, 2020. 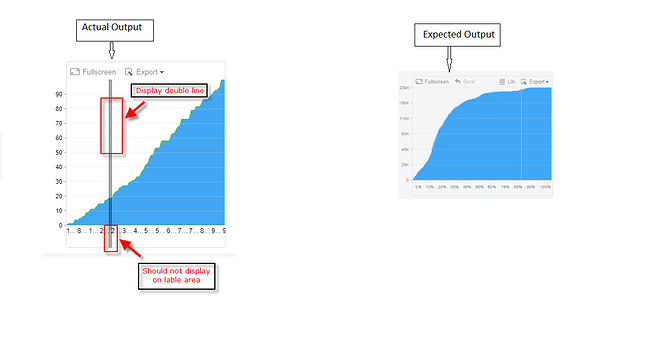 But we required exactly same as expected output for issue number 4.
a) Vertical line in chart display as double line. It should be thin line same as expected output. b) Vertical line display in label area of X-Axis. Could it be restrict to the axis line ? same as expected output. c) White color is required for vertical line. Is it possible to change color ? a) As I previously stated, similar behavior can be achieved using selection API method and that means you select at least one or more categories. So selecting at least one category will mark respective column resulting in a rectangle (so that is why double line appears). We don't have single line thresholds or markers currently in FacetChart. No, selection marks also facetAxis. This could be added as a feature request if you wish. Selection style can be changed as in the following example. In that way you can set lineColor to white. And remove fillColor (set it to transparent). Regarding issue 4, another option would be to pass pre-processed data to the chart where instead of 20 categories (2000 to 2020) you have data for 5 categories (2000, 2005, 2010, 2015, 2020). Thank you, all issues are resolved with your help. Please suggest any alternative if you have. Currently FacetChart doesn't have facetAxis.minUnitWidth as it does in TimeChart (timeAxis.minUnitWidth). That would fix this issue. //The width of a single unit that will trigger a zoom-out action when the user swipes up. defaultUnitWidth would set initial unit width until user starts to swipe and change it. We could add minUnitWidth to feature request list as this sounds reasonable to have such feature on FacetChart as well. If not, please provide your chart configuration so that we can try to reproduce. Currently we was not able to reproduce this behavior. Please provide also "series" configuration. Here is an example that is based on the configuration you provided. We are still unable to reproduce the issue. We have value from 1-100. Ok, now we see that the first label is indeed cut. So we will investigate why it is happening and hopefully give a solution. No currently we don't have any update on this.